Why Do They Put Gravel on Flat Roofs? On many flat-roof (low-slope) commercial buildings, it’s common to see gravel on top of the roof. Have you ever wondered why contractors install gravel on flat roofs? 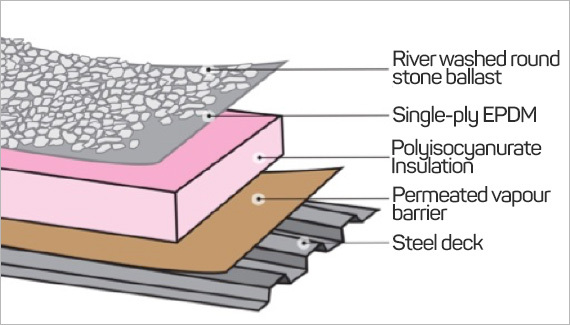 To protect the underlying layer of roofing materials, as is the case with built-up roofs (BURs). To weigh down or secure the roofing material, as is the case with single-ply flat roofs. There are different types and weights of gravel used on flat roofs for these purposes. 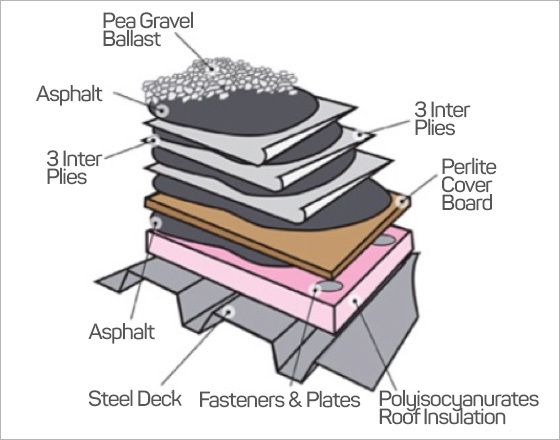 A built-up roof (BUR), sometimes called a tar-and-gravel roof, is a tried-and-true style of flat roof. Here, alternating layers of roofing felt (usually fiberglass) and hot-applied asphalt are combined to create a long-lasting roof system. The weatherproofing layer of gravel gives the roof’s surface a longer life and helps prevent cracking, blistering and degradation, which could lead to leaks or other material failures over time. Because the gravel holds and releases heat, the layer of gravel on a BUR flat roof can both help water evaporate and keep heat away from the underlying roof structure. The gravel provides a better grip for foot traffic when conducting maintenance or repairs. The gravel also acts as a protective measure to prevent natural debris (such as leaves) from flowing towards and clogging the drains of the flat roof, instead, trapping them in place. Ballast is a different style of gravel, which is applied to single-ply roofing systems. Although the primary purpose of ballast is to weigh down the roofing materials, it also offers similar protective benefits as described above. Ballast is commonly used with roofs made of tar-and-gravel roof alternatives, including ethylene propylene diene monomer (EPDM), polyvinyl chloride (PVC) and thermoplastic polyolefin (TPO) single-ply flat roofs. Single-ply roofing materials aren’t self-adhered, nor are they sealed together in any way. Since nothing secures the waterproofing membrane to the roofing materials underneath, ballast is needed for weight to protect the roof from strong winds. A ballast system helps cut roof system application costs, as it takes less time to install since sealing the layers together isn’t necessary. Ballasted flat roofs are a popular choice, especially for commercial buildings. Although single-ply roofs inherently have sun-protective qualities, ballast provides an extra layer of protection from UV rays. Ballast also protects against hail and from foot traffic during repair or maintenance work. Because the ballast stones are “loose-laid,” and not embedded into a layer of tar (asphalt), the gravel is easy to move when conducting repairs or maintenance. Copyright © 2004-2019 IKO Industries Ltd., IKO Industries, Inc. and their affiliated and related entities. All rights reserved.